Fay Ray, "Egg Arch and Pearl Portal," 2018, dye sublimation on aluminum, 79 x 40"
Fay Ray’s exhibition “I am the House” ranges from complex dye-sublimation prints on aluminum, to simple design elements in multi-media sculptures. 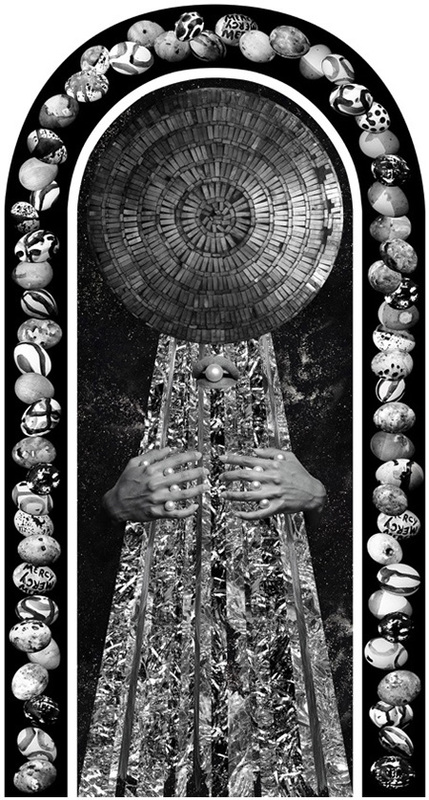 Influenced by the diverse examples of John Baldessari and Kara Walker, her prints are photo montages of recurring themes. Representations of flowers, eggs, corn, cups, jewels and chains are treated obsessively so as to make reference to stages of life. These objects and images are arranged and photographed with symbols and themes that are carried through to her sculptures, a duplication that enhances the emotional impact of the series. The three-dimensional representations are further fetishized in her inventive and seductive use of materials such as zinc, aluminum and marble. Abstract compositions metaphorically make references to religious relics. “Egg Arch and Pearl Portrait,” for example, brings to mind church portals and the icons found within. “Desert Shore” on the other hand, represents a dream catcher, a reference to the occult. In both her photos and three-dimensional representations, the power of objects becomes manifest through her surreal arrangements and designs.